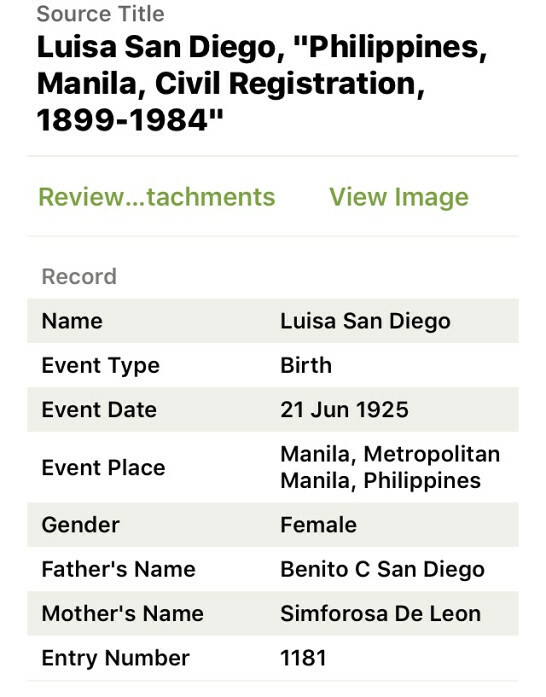 This record of my great-great-great-great grandparents’ marriage in 1812 was taken from the Registros Matrimonios in San Pascual de Obando Parish in Bulacan, Philippines. 1. This record takes me back one more generation and defines the names of two sets of my great-great-great-great-great grand parents, Roque de San Diego and Ana Bernardo, on one side, and Juan Candida and Maria de la Concepcion on another. 2. What is the abbreviated term that precedes “naturales” (assim[…]) and describes the relationship between the bride and her parents? It is the first time I have come across this term. Typical descriptions would be “naturales” or natural parents, and “legitimos” or parents from a legitimate marriage. Some Philippine towns are more rigid about defining this, while others are not. 3. Why did the bride’s parents carry the titles of Don and Doña; while the groom’s parents did not? In colonial Philippines, these titles were honorific in nature, automatically attached to individuals of significant distinction in the community, rather than reserved for those of noble birth. It would be interesting to know how the Candida Family attained their social stature — perhaps that will be key to sourcing where the wealth of the later San Diego generations were rooted. 4. Where did these families live? Typical of the practice of the times, where the couple and their parents lived are described in the document, not in actual street names; but by the name of their cabezas del barrio or barrio captains. I would need more information before I could plot this out in a map. 5. Note the use of abbreviations in this record. I am not certain if these are considered standard clerical shorthand of the times or if these are unique to the person who wrote the record. Nonetheless, similar abbreviations can be found in the volume set from which this record was lifted. Pronounced [san-di-ye’-go], the family was named after Saint James — most likely, Saint James the Greater (not St. James the Evangelist), who brought Christianity to Spain and is the nation’s patron saint. The spelling variations of this surname include Santiago, de Santiago, Santyago, de Santyago, Sandiego, San Jaime, Yago, Yagüe, Yague, Yagües, Yagues, Yáguez, among others. This name was first found in Galicia, an important Christian kingdom of medieval Spain. The San Diego’s name predates the Claveria Decree of 1849, as we have found documentation on the lineage up to the early 19th century. The San Diego’s ancestral home is Obando, Bulacan, Philippines; where the earliest known patriarch, Roque de San Diego was born in the late 17oo’s. In the 1880s, Mariano Avendaño San Diego migrated to Parian, Cebu and settled there. The home that Mariano and his wife, Maria Yap, still stands today and is reputed to be the oldest residential structure in Cebu. His descendants took the conjugated version of the family name, Sandiego. 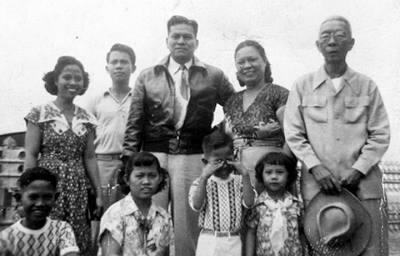 Our branch of the massive San Diego clan moved to Manila City before World War II, but a significant majority still remain in Bulacan. Mariano Avendaño San Diego was born to Rafael Roxas San Diego and Juana dela Cruz Avendaño of Obando, Bulacan. According to oral narratives, he went to the Visayas together with a priest who was assigned to serve in Pari-an, Cebu in the 1880s; and married Maria Yap (1857 – 1947) soon after. 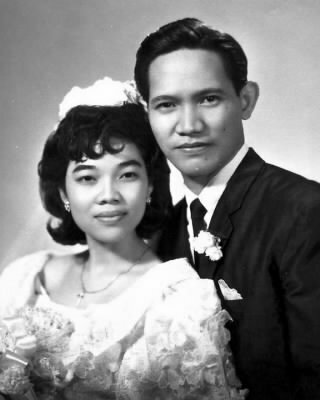 The couple made their home in what is now known as the Yap-Sandiego Heritage House. Mariano served as a cabeza of the Gremios de Mestizos in the Pari-an district of Cebu. According to interment records, he died de muerte repentina (of sudden death) in 1897. His remains are buried in Carcar, Cebu. The Yap-Sandiego Heritage House is a 298-square-meter balay nga bato og kahoy (house of wood and stone) located at the corner of Mabini and Lopez-Jaena Streets in the Parian district of Cebu City. It was built sometime between 1675 and 1700 and is one of the oldest existing residential structures in the Philippines. 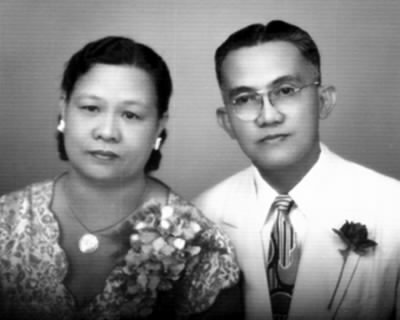 Spouses Juan Yap and Maria Florido, its earliest known occupants, passed on the property to the Yap siblings: Maria, Eleuterio, and Consolacion. 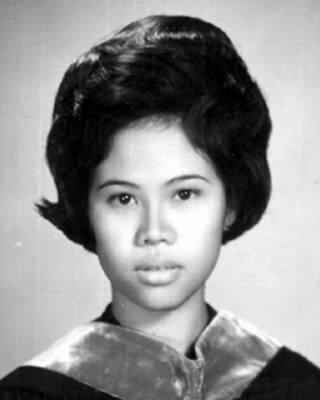 The eldest daughter, Maria Florido Yap, married Mariano Avendaño San Diego in the 1880s. The house was crafted from narra and other hardwood and roofed with wooden tiles. Typical houses in the Pari-an district were “substantial stone-and-wood houses that followed a distinct pattern: the solid, permanent-looking structure fronting the street, the bodega ground floor and the upper-floor living quarters with the often excessively large rooms, wide windows and azoteas that responded to the need for ventilation and the impulse toward gracious display… that spoke of the Hispanified lifestyle of the local principalia,” writes noted Cebuano scholar Resil Mojares. As the business center of Cebu in the late 19th century, the Pari-an district morphed into the most prestigious section of the city, where the founding families of Cebu, mestizos of Chinese and Spanish origin, lived and worked. The area was exclusive and patriarchal — its inhabitants dominating the socio-commercial activities of the growing city. In recent history, the Yap-Sandiego house was used as a boarding house for students of nearby schools and universities. It was passed onto noted Cebuano choreographer and art collector Valentin Mancao Sandiego and his wife Ofelia Pacina Zozobrado in 2003. The house is now undergoing careful renovation and outfitting for a museum and art gallery. 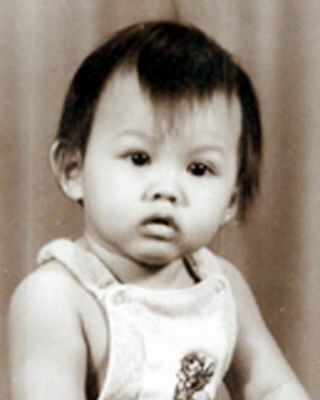 Pronounced [por-sing’-ku-la], the family name is a derivative of portiuncula. This word is a likely abbreviation of the Italian phrase porzione piccola or “tiny portion”. Portiuncula is a chapel (also called St. Mary of the Angels) near Assisi, Italy where St. Francis began the Franciscan order in the thirteenth century. The Portiuncula Indulgence is the first plenary indulgence that was ever sanctioned by the Catholic Church. The indulgence grants to he who visits a church on August 2 and confesses his sins with a contrite heart, freedom from all temporal punishments and purity as after holy baptism. The indulgence was named after the church where St. Francis’ apparitions prodded him to gain Pope Honorius III’s approval. In 1769, a Spanish expedition in California came across a river that they named El Rio de Nuestra Senora la Reina de Los Angeles de Porciuncula or “the River of Our Lady the Queen of the Angels of Porciuncula.” Twelve years later, 12 families settled in the area and named their community El Pueblo de Nuestra Senora la Reina de Los Angeles de Porciuncula, after the nearby river. In later years, the city became known as Los Angeles. The line, as we know it, originates from San Bartolome, Malabon, Philippines — where Cirilo Porcincula was born. At the time, Malabon was within the jurisdiction of the province of Rizal. 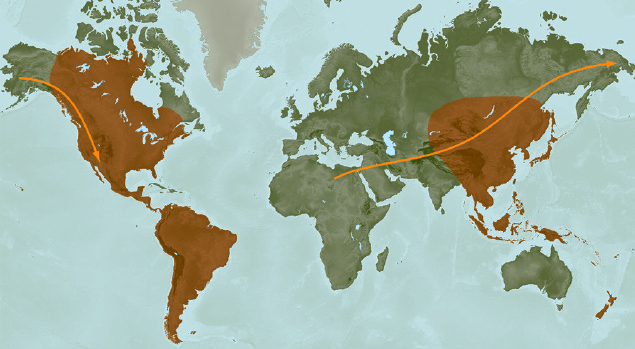 Physical features of the clan indicate a likely Chinese lineage. 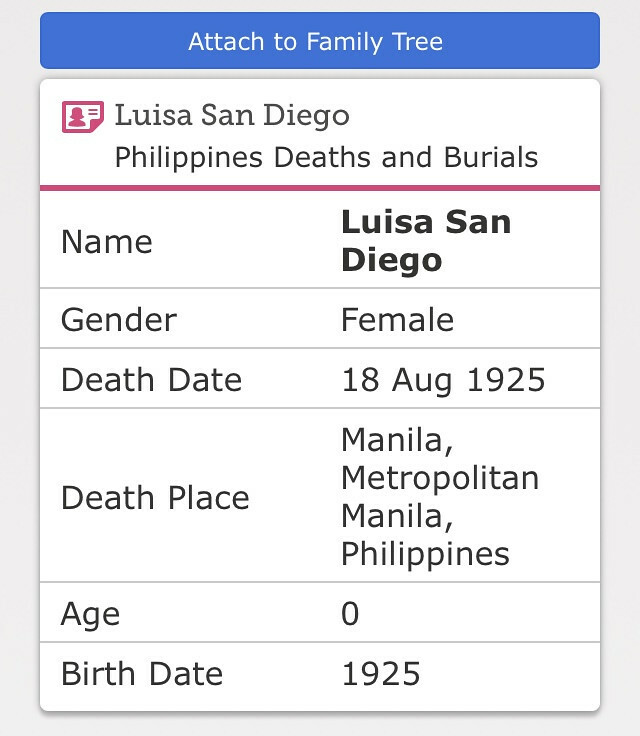 A Eugenia de Leon Porcincula female married in to the San Diego Family in 1933. Look through our name database, or request access to the Porcincula Family Tree on Geni.